AMD Mobility Radeon 7000 Series Leaked, Codenames Revealed. The Lineup starts with an Ultra High End Mobile GPU named “Wimbledon” which will feature a 256-bit wide high-speed GDDR5 memory interface, 2-4 GB of dedicated memory, and 65W TDP. 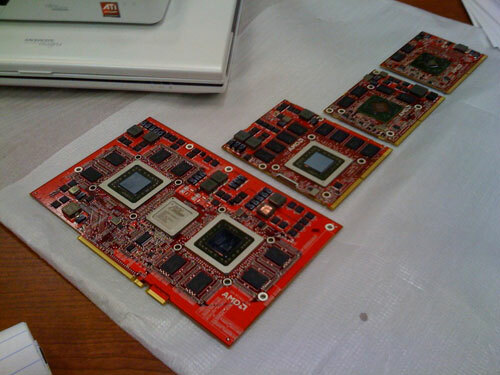 This DirectX 11 M-GPU is said to be 25% faster than the “Blackcomb”, the Mobility HD 6000 series flagship and is slated for Q2-2012. The other high end chip is the “Heathrow” mGPU, which has a 192-bit or 128-bit (selectable between variants) GDDR5 memory interface, 1-3 GB of dedicated memory, up to 45W TDP, and 30% higher performance compared to “Chelsea” and will come around Q4-2011. This could also mean that the Desktop variants of the HD7000 series will be available by the end of 2011. Coming to the Mid-End chip which includes the “Chelsea” itself, with its 128-bit GDDR5 memory interface, 1-2 GB memory, 20-30W TDP, performance 30% higher than “Whistler”, production starting in Q4-2011 and the last one codenamed “Thames” which is a mainstream chip offering 128-bit GDDR5 with option of GDDR3, 1 GB memory, 15-20W TDP, and 100% higher performance than “Seymour”, I’s also slated for Q4 2011.